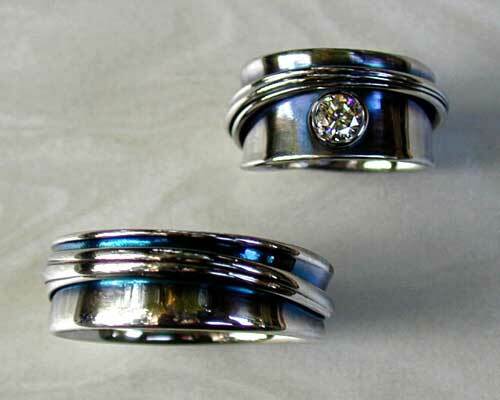 For over 30 years, we at Metamorphosis have been creating highly personalized custom made jewelry. For me, jewelry is something that the wearer should be able to relate to on a very personal level. Whether simply from a design aesthetic, or perhaps even deeper, with a more symbolic meaning. This I find especially true when I'm creating something that connects two individuals. This could be for a special occasion like an engagement, a wedding, or anniversary. To create something unique, one-of-a-kind, and meaningful to its wearer, that's what I find really exciting. Years ago, an elderly woman came to see me with a heavy bag of rocks. She also had a collection of images showing various details of canoe paddles. She commissioned me to make a six-inch paddle in sterling silver. The bottom had to be just like this, and the top had to be exactly like that. She asked to have the paddle lean against one of the rocks as a paperweight.. As it turned out, she had been a camp counselor in her 20s, and on her first day, she met this gentleman who accused her of stealing his paddle. And so now, after 50 years of being married to him, she was finally admitting to it, and returning his paddle on their anniversary. Another person brought in a rough piece of shale. He asked me to cut it into a heart shape and polish it, and then asked to have it set in a spiraling free-form pendant. He told me that this was a piece of the rock that he had originally been standing on 25 years earlier when he had proposed. One gentleman that came in said that "he wanted to tie the knot". He pulled out a piece of very thin climbing rope with a sample knot tied in it. 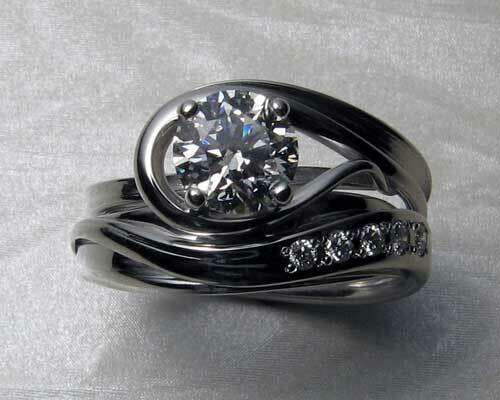 He had this idea of an engagement-knot-ring with a diamond set in the center. I was struck by the intricate weave of this high-tech rope, and so I ended up developing a process where I could mold directly from the rope to preserve its detail. As it turned out, both him and his fiancée were world class rock-climbers and she had even written books on the subject. It was the ultimate ring for a climber. My preference is creating custom jewelry because I get to see the big smile on a persons face when they come in to pick up their order. Again, for me jewelry is a very personal thing, and that’s also the way I like to do my business, on a one-to-one basis. Whether you have a photo, a rough sketch, or just a concept. Or perhaps you have a collection of old gold or stones you would like to have remodeled.